Telangana Borad of secondary Education Hyderabad bse telangana SSC Fee Details Date Wise. 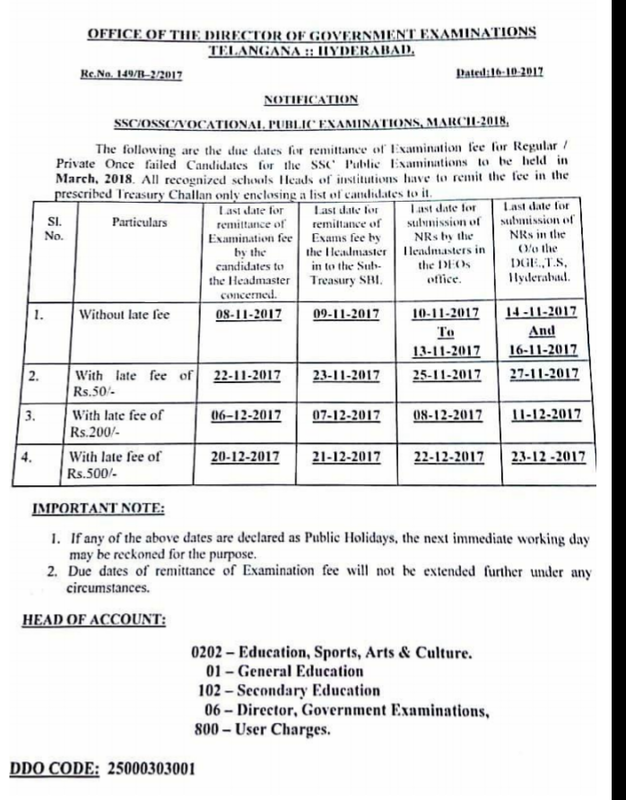 Telangana Director of Govt Exams Released Notification to Pay Fee for SSC Annual Examinations to be held in March of 2018 Released Schedule to Pay Fee | Fees Dates for SSC March 2018 in Telangana ts-telangana-ssc-march-2018-public-exams-fee-dates-submission-nrs-online-dse telangana SSC cdse bse SSC march 2018 exam fees dates. TS DGE Rc. No. 149/B-2/2017 Dt;16-10-2017 TS SSC/ OSSC/ Vocational Public Examinations March -2018 Fee Due Dates Announced.